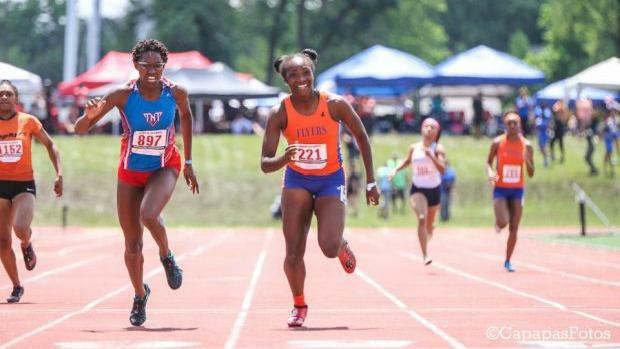 The biggest meet on the summer calendar in Illinois is the USATF Association State Meet, which is essentially round one of three for athletes who hope to qualify for the National Junior Olympics in July at North Carolina A&T University. Day one was washed away due to a combination of Mother Nature's wrath and standing water on the track of Benedictine University. Many athletes received automatic advancement to the Region 7 meet (July 5-8th at Ball State University). Day two weather still presented challenges to the field of competition, rain and standing water on the track delayed competition by at least three hours. The 400 hurdles kicked things off, the seldom ran event in Illinois produced top marks and victories from Kenli Nettles (Arthur HS) 1:03.71, Karyn Best (Wheaton Academy HS) 1:04.31, Briyon Watts (Southland College Prep HS) 1:00.58, and Mason Barr (Ridgeview HS) 54.88 in their respective gender and age division. Koren Leonard (Oak Park-River Forest HS) and Robert Cayet Jr (Grant HS) presented a challenge to Barr. The 100m dash was contested in slick, chilly conditions and into a headwind. Kaylah McCall (Homewood-Flossmoor HS), the 3A 100 hurdle champion, won the 15-16 division 100m, Taylor Gilling (Highland Park HS) ran away with the 100m crown in the 17-18 division while Bobby Nuzzo (Mundelein HS) was the only male athlete to go sub eleven in the 100m (10.86). Khullen Jefferson (TF South HS) future looks bright as he won the 15-16 division 100m (11.56) and 200m (22.26). Day three brought warmer weather, Jason Thormo (Grant HS) 48.42 won the 17-18 400m edging Brandon Adams (Minooka HS) 48.59, while Taylor Tilmon (Lakes HS) 54.50 came from behind to secure the win over DaJour Miles (West Aurora HS) 54.51 in the Girls division. McCall 14.45, Matthew Lewis-Banks (Homewood-Flossmoor)14.36, Kayla Walters (Bolingbrook HS) 14.78, and Mychah Spells (Andrew HS) 15.53 won short hurdle titles after a ten-minute break. Tina Martin (Decatur Eisenhower HS) 24.20 edged Gilling 24.24 in the 200m, while TNT Track Club had four athletes go dip under 22 seconds led by Nuzzo's win (21.52). In the field events, Chloe Lindeman (Fulton HS) took the shot put victory for her division, while Sam Liokumovich's (Deerfield HS) 55'8.5" throw secured his victory. Kinnard Hughes ( Chicago Kenwood HS) unleashed a huge lifetime best in the long jump (23'4) for the win over Geremiah Lawson (Plainfield Central) 23'1" while Tyrone Treadwell (Springfield HS) 46'11" held off Quinton Stringfellow (Homewood-Flossmoor) 46'3.25" in the 17-18B triple jump.